Looking for something new to do at the weekend this summer? 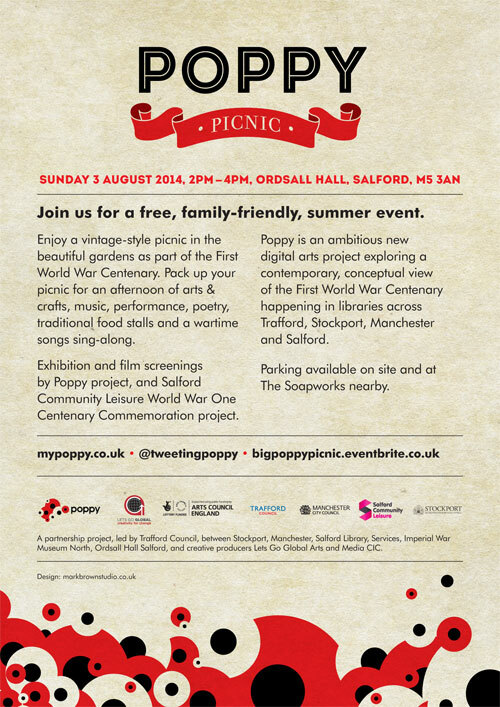 Pack a picnic, bring your family and friends and join us at Orsdall Hall, Salford at 2 – 4pm on Sunday 3 August 2014 for a free, summertime event. Enjoy a vintage-style picnic in the beautiful gardens for an afternoon of performance, music, poetry and artwork as part of Poppy, a First World War Centenary project. Sing-along to a selection of wartimes songs, create something lovely in the arts & crafts marquee and if you’re a foody, you’ll love sampling some of the traditional goodies on offer. There’ll be exhibitions & film screening, and Salford Community Leisure’s Year of Commemoration for First World War with new work by artists & community groups. There’s also the first chance to explore and download our new artwork-app. Poppy is an ambitious new digital arts project happening in libraries across Trafford, Stockport, Manchester and Salford. It’s exploring a contemporary, conceptual view of the First World War. Parking available on site and at The Soapworks nearby. You can book on eventbrite, or simply turn up on the day! Poppy is a partnership project, led by Trafford Council, between Stockport, Manchester, Salford Library, Services, Imperial War Museum North, Ordsall Hall Salford, Salford Community Leisure Trust and creative producers Lets Go Global Arts and Media CIC.